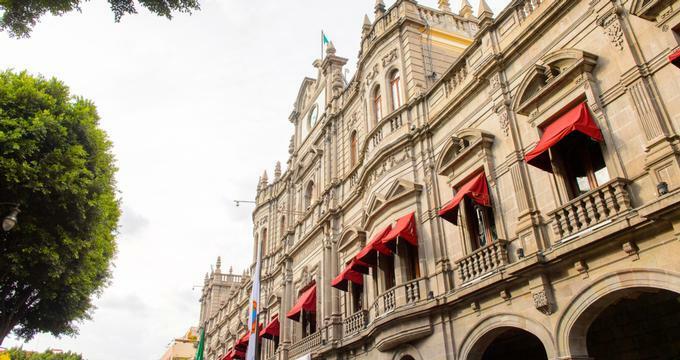 Puebla, also known as “De los Angeles,” features elegant buildings from colonial times, unique flavors, and interesting streets. The city contains beautiful facades with talavera, and is a unique and authentic destination. Puebla is a perfect combination of modernity, natural beauty, culture, tradition, and history, with colorful buildings and touches of art. Many people, from travelers to intellectuals to artists, have found inspiration in Puebla, as well as a place to relax and escape for their daily lives. Numerous treasures, delicious cuisine, and traditional buildings all comprise this destination and make it a memorable place to visit. Puebla’s gastronomy is a fusion of European, Mexican, and Asian influences. The city is full of a variety of dishes that seduce the palate and the eye, which is how the destination has gained its worldwide fame. While there are many different dishes to try, one of the most recommended is chiles en nogada. Along with the exquisite taste of the dish, it also feature the national colors of Mexico. The dish of molotes criollos is made by mixing wheat and corn, and filled with cheese, potato, or a pumpkin flower. Traditional cemitas look like a salt biscuit, similar to those once used for a tribute to the Spanish crown. For visitors with a sweet tooth and those who love dessert, some treats to try while in Puebla include borrachitos, muéganos, turrons, buñuelos, jamoncillos, camotes, and of course, the amazing tortitas de Santa Clara. The restaurants in the city of Puebla are filled with specialists on a daily basis who come to try the moles, mixtures of chocolate and chili or banana and tomato. Visitors can also participate in various workshops in gastronomy. Several restaurants, as well as local residents, offer gastronomy workshops for anyone wanting to learn how to make various dishes. These workshops feature activities like buying ingredients at the market, washing and cutting these ingredient properly, seasoning and cooking with them, and then finally enjoying the food. There are also food festival that take place in Puebla. In July, visitors and locals alike can enjoy the Mole Poblano Festival, or the Chiles en Nogada Festival in August. Situated within the Biosphere Reserve of Tehuacán is the Helia Bravo Hollis Botanical Garden. The Garden features over eighty different species of cactaceae. Some of these species are on the brink of extinction, and only exist in this region, and nowhere else in the world. Visitors can see an array of marine fossils at the Botanical Garden as well. These fossils are from millions of years ago, during the time when the region was a seabed. A climb up to the top of the observation tower offers an excellent opportunity for birdwatching. Guests can look for stealthy eagles flying around in search of lizards, snakes, and small mammals. A walk through the exhibit area of the Helia Bravo Hollis Botanical Garden offers some interesting information. Guests can discover the nutritional, medicinal, and ritualistic uses for a number of different plants that were used by people during pre-Columbian times. Information can be found about the suggestive names for each plant, as well as the commercial exchanges.